We know that the decisions we take can have an impact on your day-to-day life. That’s why we want to make sure that you not only hear from us or about us, but also have the chance to talk directly to us and with us. The ECB Youth Dialogue gives you the chance to do exactly that. We hold events around Europe – and online – that put you in direct contact with ECB policymakers so you can ask any questions you have and share your views with us. Students and alumni from Frankfurt School of Finance and Management had the chance to talk to the heads of European banking supervision about their work to keep banks safe and Europe’s financial sector strong and stable, in the interests of all of us. With their terms of office drawing to a close, Supervisory Board Chair Danièle Nouy and Vice-Chair Sabine Lautenschläger looked back on what has been achieved since European banking supervision was established in 2014 and shared their experiences of what it was like doing something that had never been done before. Here’s a taster of the discussion! 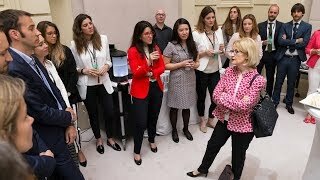 Danièle Nouy, Chair of the Supervisory Board, met with a group of young professionals working in the financial industry in Madrid. They had many questions for her, not only about European banking and financial stability, but also about ethics in finance, digitalisation and other more personal topics, such as what motivates her to do the work she does. The event, which was held in partnership with Banco de España, was a great opportunity for younger professionals to share their thoughts and experiences with a senior policymaker and to learn from each other’s perspectives. Banks’ reputations suffered with the crisis. How do we regain people’s trust? Ethics are crucial. Banks need to take a longer-term view and act ethically. You can help to make banking safer and better. We are working hard to adapt to the new environment we’re in. Are regulators doing the same? Yes, we are working as hard as you to adapt. I have been doing supervision for 40 years, but I’m learning something new every day. That’s the beauty of the job. It’s very intellectually stimulating to do this job! In my opinion, one of the biggest threats to European banking is the entrance of new players. What’s your view on fintech? I think innovation is the name of the game. There will always be customers that will pay for traditional banking services, while others, like my granddaughter, do everything by phone. There is room for all kinds of bank. But fintechs offering banking services will be supervised as banks. Do you think there should be more mergers and acquisitions in Europe? We need fewer banks, but there are different ways of fixing the issue. Banks can be wound down or they can merge. But mergers need to be strategic and result in sustainable banks. Two ducks don’t make a swan – especially two sick ducks! I really enjoyed meeting these young people – they had very good questions on many topics. They were not shy! Do you want to know more about the topics of this ECB Youth Dialogue? Take a look at the following pages!